We’ve noticed a lot more people using a single page application (SPA) framework called DurandalJS, and as a result we’ve also noted an uptick in inquiries on how to use Wijmo in a Durandal application. This blog post aims to demystify much of the process of getting this to work properly. 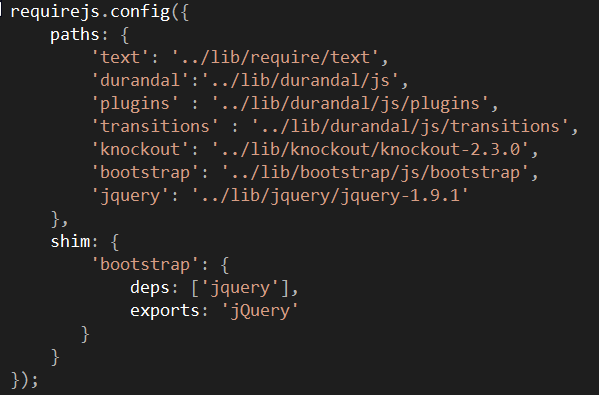 DurandalJS is a framework built on libraries that many of us are already familiar with. These include jQuery for easier DOM manipulation, KnockoutJS for data binding and RequireJS for AMD supported design patterns. There’s some good news there if you’re a Wijmo fan; as you know Wijmo follows the same philosophy, as such, we already support all of these libraries. That means that we can just download the DurandalJS starter kit and get to work. There are some areas in the starter kit that are worthy of some special consideration, so let’s take a few minutes to step through this slowly since getting a handle on things can really get confusing with the way that asynchronous calls and promises are layered throughout the application. The "main.js" file does a lot of the heavy lifting for the application. You’ll find it inside the “app” folder. It’s responsible for configuring RequireJS to load scripts in a modular fashion. Let’s take a look at the config: This is why you won’t see many script references in the index – they’ll be loaded as needed by RequireJS. You’ve also probably noticed that all of these scripts are kept locally in the “lib” folder. It is possible to use external scripts, but in this sample, we’re going to keep it all local. 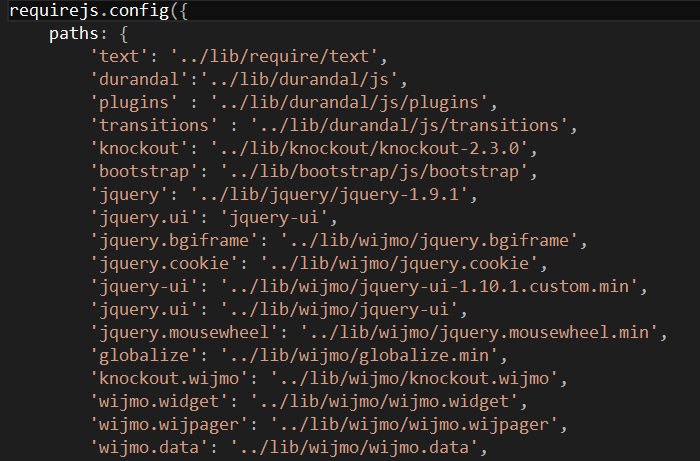 In case you haven’t already done so, download the latest version of Wijmo and unzip it. Inside you’ll find a folder labelled “amd-js” which contains the entire Wijmo library broken up into modules and organized by namespaces. It also contains any interoperability scripts needed to enable Wijmo to work with external libraries as well as our supported external libraries themselves. We’re going to copy it into the “lib” folder inside of our starter kit. Once it’s there, rename it to “wijmo”. Some of the external libraries are now made redundant because they already existed inside this sample app, so you may want to do a little housekeeping. For the sake of simplicity I’m going to make sure that you’re aware that in many cases, one widget will need access to several namespaces to operate properly. With that in mind, I’ve decided to add the ComboBox and the Text Editor to the sample application since they have several dependencies. This is one of the most important steps in this process. Take your time here and make sure that you give each widget appropriate access to any namespace that it needs. If you don’t, we’re going to be back here sooner or later when debugging. If you do get hung up here, I’ll be covering some debugging pro-tips in part 2 of this post. In this post, we've familiarized ourselves with the DurandalJS starter kit, and incorporated Wijmo's resources into the application. We've also told RequireJS where to find these resources. In part 2, we'll set up the views and view models and cover any gotchas and troubleshooting steps to ensure your success.